I actually had some HoneyBaked Ham for the first time in like forever this weekend. My wife had an urge for some and we stopped by. Here's a gift card for US residents to win. Ends 12/18. Good luck. Don't get stressed with meal prep. HoneyBaked has all of the food you need to feed your crew. Another way to simplfy your shopping is ordering your HoneyBaked meal ahead of time. Here is a great way to save time and money! When ordering online, simply enter promo code 720877 at checkout to save $5.00 on a half bone-in ham. This promo code is good for online purchases only. Then when you schedule permits, head to your store and pick up your order. Stay connected to HoneyBaked for all of the latest news and savings information. 1 winner will receive a $50 HoneyBaked Gift Card! a Rafflecopter giveaway Disclosure: The participating bloggers were not compensated for this post. We are not associated with any of the companies named above. No purchase is necessary to enter. Void where prohibited by law. The odds of winning are based on the number of entries received Open to US Residents, 18+ only. Limit one entrant per household. Confirmed Winner(s) (by Random.org) will be contacted by email. Winner(s) have 24 hours to respond before a new winner is chosen. No purchase necessary. Void where prohibited by law. The sponsor(s) will be responsible for product shipment to winner(s) of this giveaway. My blog is not responsible for product shipment/delivery. This event is in no way administered, sponsored, or endorsed by, or associated with, Facebook and/or Twitter, Google, Pinterest, Instagram or Klout. This disclosure is done in accordance with the Federal Trade Commission 10 CFR, Part 255 Guides Concerning the Use of Endorsements. Entrants must only enter with either one email address, IP address and/or Facebook account, anyone found violating these rules will be disqualified. It is at the sole discretion of the admin of the giveaway if the winner has met the rules or not. I like baking Christmas cookies and then having a big dinner on Christmas with family and friends. We have a special dinner on Christmas Day and Open Presents. We bake tons and tons of cookies as a family. Love the time spent together. I love the cookie baking and treat making, especially. We open all of our gifts on Christmas Eve, then Santa comes Christmas morning. We like to get up at 5 am on Christmas morning, open gifts and spend the day together enjoying each other. We always have a huge Christmas Day Dinner at noon at my mom's house with about 40 people attending. We make fresh chocolate chip cookies after late mass on Christmas eve. We did when we were kids for Santa. Now we do it and so do the children so it was a tradition from my parents to us and now the grandchildren. I bake cookies with my children every year. We have our Christmas party on the eve so that we can open our xmas gifts at midnight. Our traditions mostly center around food. we use my late Grandmother's recipes even though she's been gone for over twenty years. Other than that, we are pretty flexible about everything, even when we celebrate, lol. (With so many places to drop in on, sometimes you have to a few a day or two before Christmas. I enjoy baking sweet treats during the holidays. I don't have a lot of family left. I have three beautiful daughters, and there's my sister, her husband, their two adult sons, one of who is married and has a 4-year-old daughter. We've been driving up to Wisconsin (about 3 hours each way) every year on or right around Christmas to spend a day together. This year, my sister and her husband will be out of town on Christmas, so we planned on going the Saturday after Thanksgiving. We had to postpone until this past weekend because Lisa, my nephew's wife, was in the hospital. Unfortunately, it also meant that my youngest daughter wasn't with us, as she lives in Florida and only gets up for a few days on and around Christmas. So, that is my one tradition that we still do every year. The holidays traditions in our house are going in the woods and chopping down a tree, baking cookies, making a christmas eve dinner and then opening gifts. We love going to the Christmas Eve service at our church and then we go home and have a nice meal and open a few gifts and just enjoy being together, thanks! The family gets together, we share stories and have a huge meal. My favorite tradition is going cross country skiing with my family on Christmas Day. We like to listen to the Nutcracker and watch it if we can. We often fix hot chocolate with a shot of hazelnut liquor and some whipped cream. The week of Christmas we'll ride around listening to Christmas carols and looking at the lights. There is just the two of us so we don't have any traditions...sometimes we go out of town and sometimes we stay home and see friends. We are of Polish descent so we do Kielbasa and pierogis on Christmas. Along with a lot of other food needless to say, it's a Feast of massive proportions! HoneBaked Ham is awesome! My husband is lucky enough to get it catered for his work functions, but not so much for me... This would be great to have a date night of some delicious sandwiches! One of my favorite tradition is making a thermos of hot chocolate and going with the family to pick out our tree and singing carols the whole way! We pick up and decorate Christmas tree together. I get my kids a new ornament every year. We also go to my dads grave. I love spending time with my family, we all wear our Christmas pajamas on Christmas eve and play board games. My favorite tradition is the treasure hunt we set up for the kids on Christmas morning. We leave clues all around the house that eventually lead to the first gift they get to open. Every Christmas Eve we go to mass and other family members meet us there. Afterwards everyone comes to our home for a late dinner. Tell me in the comments below what are some of your holiday traditions. We have a big family Christmas eve buffet dinner where everyone brings their best foods and we eat, talk, play games, exchange gifts and video chat with anyone who can't make it. I enjoy having get together with Ham, greenbean casserole and Mashed potatotes and rolls. we've just started doing elf on the shelf with my two kids and they love it. every where we start our advent of 25 fun things to do all month, like the trail of lights, seeing santa, building a gingerbread house, go ice skating. we also love watching christmas movies. they get christmas eve presents from the grandparents and santa's presents on christmas day. we love writing letters to santa, putting out milk and cookies for him, tracking him on radar the night before and stringing the christmas tree. and you can't forget christmas music! we really have a blast. 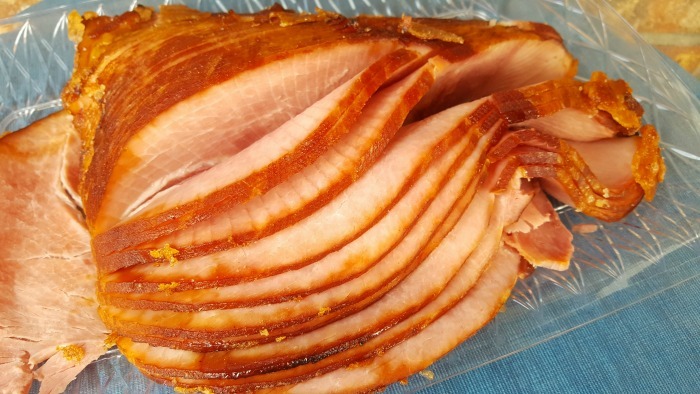 Both Thanksgiving and Christmas dinners must have Honey Ham sliced turkey. We always look forward to it! Our holiday tradition is to always bake pies with my kids around the holiday time! Everyone comes over to our parents house for a large breakfast, specifically corn fritters (a thin pancake with corn in it) topped with cherry pie topping and whipped cream. Then we open gifts and spend time together before having an early dinner. It's a nice all-day sort of affair. Good company, holiday movies or TV shows, the Holiday meal and looking at Christmas lights on a drive or online. One of our family traditions is loading up in the car, putting on Christmas music and going out to view the local light displays. We always drive around the town looking at everyone's decorations. We bring hot chocolate as well. The family comes to my house every year for our holiday dinners. As long as I can remember, baking has been one of the biggest traditions our family upholds during Christmas and one of my favorite holiday traditions! I love baking cinnamon rolls on Christmas morning! Some of my favorite holiday traditions are going to see the christmas light shows, decorating the house, and listening to christmas music! My boys and I make cookies for Santa on Christmas eve then I get them to bed and wrap presents and then we get up in the morning and open presents then we hang out with the whole family and then eat Christmas dinner. 20-25 family members get together at my grandfather's old house and feast on turkey, ham and all of the stuff to go along with it. My mom and I cook 1/2 of the dinner and my aunt cooks the other 1/2. It's a ton of work...I'd love to let HBH do the work! I make cookies with my granddaughters. My husband fries a turkey and roasts a ham. I love to hosting a gathering of family and friends on Christmas Eve. Our holiday traditions change based on whether or not we are traveling for Christmas. This year, we are staying home, so we open one present the day before Christmas. My family gathers at Christmas time for a tamale making party. We open one gift on Christmas Eve. Our Christmas traditions as a family were to open gifts on Christmas morning and eat brunch together. Now unfortunately the entire family lives states away from each other. I try to bake cookies and bread for Christmas. My favorite holiday tradition is that we open presents on Christmas Eve instead of Christmas morning. My family always opened our gifts on Chritmas eve, now that I have grandkids, we open one gift and save the rest for Christmas morning. Growing up, we visited grandma in nursing home on Christmas eve. We would play a Spanish Bingo and Trivial Pursuit. On Christmas Eve we watch the Grinch and have hot chocolate. We make baked goods and attend church service. We always have a cookie baking day and go to a Christmas Eve service!